Write, Read, Watch | Bringing the frights you deserve. Harry died in a car accident on April 5th, one year ago to the day. He had died on his way home from the florist. April 5th was also his and Mandy’s anniversary and they had for the nearly 15 years of their marriage gone out to dinner and dancing in the city. Even when she was 7 months pregnant with their daughter who was now 15 years old they had danced the night away somewhere on their anniversary. Today would make 16 years had Harry not died in that car accident. Had some guy on a cellphone not been too busy talking to someone about something unimportant he would have seen the stop sign and never t-boned Harry as his car crossed the intersection legally. Mandy had sat in her favourite chair waiting for her husband to come home. He had first been just minutes late and she was peeved sighing while she looked at her watch and thought of how they’d have to rush to the city only to get caught in rush hour traffic and be late for the club. Then it became hours. She knew then that she’d have to cancel the reservations to the restaurant that they had reserved months in advance because it was always busy. Finally, she heard a knock at the door. She wondered to herself, “why would harry knock.” But as she made her way to the front door she saw why. The red and blue lights shone into her home and she knew it was the police. Her town of Claremont was still small like that, the police would notify you if something happened themselves. They wouldn’t make a phone call, they’d just come to the house and tell you face to face. She tried to keep composure. “Maybe it isn’t that bad. Maybe harry just was arrested for being drunk,” She repeated that to herself over and over. Not caring that Harry never drank more than two beers in a day, nor ever even drank if he thought he was going to drive the car in the next 5 hours. He was a stickler for rules and made sure that there would never be the chance that he would drink and drive. But when she opened those doors all hopes of harry having been arrested were over. It took her a long time to really feel that Harry was gone. But even then she kept telling her daughter, Ann that it was hard to do, after all, Harry and Mandy had met in High School and had dated from Sophomore year in high school all the way through college. They had married during their last spring break of university using the time off for their honeymoon and then returning to finish out the semester in their separate dorms and finally for graduation they moved into the home that they would raise their children in. She had spent the last 22 years with Harry, and aside from their times as youths in high school, they hadn’t spent one whole day away from each other. But now Harry was dead and Mandy had to cope with that. So she went about her days, finding things to fill her mornings and afternoons with and crying herself to sleep every night as she held his nightshirt to her face. It was on that day April 5th a year from Harry’s death that she received a call. She wasn’t going to answer but it kept on ringing. The answering machine never picked up. “Hello,” she said her voice breaking. “Who is this?” “Mandy Candy,” a static distorted voice said from over the line. “Who is this?” she said raising her voice. “It’s me,” the voice said. “You stop this right now. It isn’t right to play tricks on widows. you ought not to play jokes on women on their anniversary.” “Mandy Candy, It’s me Harry. I’m coming to pick you up stay looking for me by the window and I’ll be there for you.” the line went dead. Mandy stood there listening to the beeping of the phone until Ann walked into the kitchen. “Mom, dad’s dead,” Ann said. “You’ll not talk about your father that way,” Mandy scolded raising her voice in anger at her daughter. “He’s dead mom, He’s been dead for a who–” Mandy’s hand slapped Ann’s face hard. Ann’s face was read like a whore with too much rouge and as she ran out of the room holding her cheek Ann’s eyes began to water. Mandy ran to her room, quickly dressing and fixing her hair for her date with Harry. And quickly returned to the living room to sit by the window and watch for him to come home in his car. She waited until she heard nothing. In keeping with the theme of today, it is after all Presidential Debate #1 day, I wanted to round up a bunch of Halloween-esque political ads and I think I found some good ones. 1. Who can forget the Demon Sheep advertisement. It was totally funny and frightening. I loved the red glowing eyes and the video ended up being talked about for weeks. The ad went viral and helped Carly Fiorina clinch the Republican Primary from opponents Tom Campbell and Chuck DeVore. 2. In a way that must have been hellish for Ms. Fiorina, the California Democratic Party made a parody ad against her for the general election. I’m not sure the ad had anything to do with it, but I’d like to think that it did, for the sake of horror fans all over, have something to do with her not winning her election bid against California Senator Barbara Boxer. 3. The final video I found, also from California, was the Night of the Living Pelosi ad by John Dennis, who is running against Pelosi for her congress seat. This one is absolute perfection and if I were a citizen of Pelosi’s district I’d cast my vote for John Dennis based on this ad alone. it’s too funny and too hilarious, tho the issues he presents are serious. You’ve got about 1 hour to get ready to watch the Presidential Debates and while I do have a person that I’m rooting for, I want to say that I don’t care whom you vote for in 2012 as long as you are an informed voter, so go out there and watch the debates and really think about what principles you want to vote for. Additionally, if you go over to the Facebook page, I am playing fallacy bingo and if someone beats me I’ll give away an Amazon gift card, see the Facebook page for more details. Fake pumpkins are an excellent way to show your Halloween spirit without engaging in a yearly battle of the mold. There are a few different brands including Fun-Kins, who have many different and some very realistic types, to the generic store brands. Stores like Target, Jo-Ann’s, the Dollar Tree, and Michaels all carry a brand of craftable pumpkin and are probably available at many a retailer near you. They range in Price from one-dollar (gotta love that dollar tree) to well over $40 for some very large pumpkins. These happen to be the greatest invention of the holiday season since flashing electric Christmas tree lights. The greatest thing about crafting pumpkins is the ability to save your designs for years to come. Should you find the need, you can just put it in a bag and you will have a nice memory piece for future Halloweens and your children. Additionally, they are also better than real pumpkins because they are light and force you to use anything other than a lit candle. 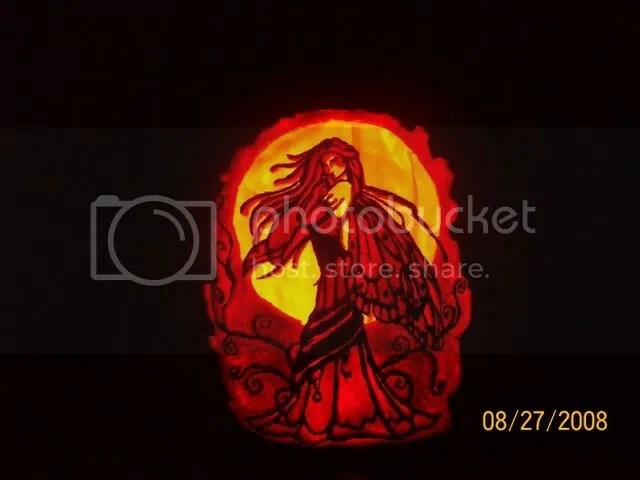 Using synthetic light allows the jack-o-lantern maker so many new and inventive lighting options including color lights, strobe lights, and even black light responsive designs. I just picked up my craftable pumpkin and as soon as I decide on a design, I will post a picture to the Facebook page. Keep visiting daily during October for more wonderful spooky ideas and articles for the 31 days of Frights. If you have, an idea or a comment, just hit us up on Facebook, Pintrest, and the comments. Also I’d love to host pictures of your awesome pumpkins so post them to the Facebook page! It’s only Halloween don’t go loosing your head. The Headless Horseman automatically is a part of Halloween simply because of the Jack-o-lantern he palms. He is a frightening figure who rides a horse and also carries a sword, ready to spread his headless affliction. Considering the fact that he can hold a large pumpkin in one hand and can throw it, he must be a very large figure, which also can be menacing. I remember watching the Disney adaption many years ago and even though the movie was animated, Disney did not pull any punches. It was as scary as any live-action movie. One thing about the Headless Horseman always bothered me: how is he able to see without eyes? Can he see through the jack-o-lantern? The horse? Does he have an invisible head? If so, is he really headless? I guess it is meant to be a mystery. Guest post by Berdo, writer of Berdo’s Retrospecting Day Parade. Follow him on Pinterest here and his facebook page here for more of his witty blog comments. He’s also a runner but you’ll have to ask him about that. If you like this Pinteresting Post feel free to . And don’t forget to to see more frighteningly awesome pins before they are posted here. Additionally, if you have a book, or Pinterest account that you would like featured as the Pinterest of the Day, or a book you’d like me to review just drop me a line either here in the Contact Me section, on Facebook, or on Pinterest, additionally you can leave a message down in the comments section as well. Every October, I get into the spirit of the devilishly delightful holiday by watching copious amounts of Halloween programing and this year will be no different. There are so many shows out there this year for us Halloweenites to watch. This year the Travel Channel will have a very spectacular lineup of shows. They actually started their Halloween programing during September and tonight they continue their head start on October with the season premiere of Making Monsters. Making Monsters chronicles the work of Ed Edmunds and his company, Distortions Unlimited as they make some of the most innovative animatronics and masks in the industry. The channel will present two back-to-back episodes weekly on Sundays starting at 8pm, so get that DVR ready. On Monday, October 1, Sci-Fi (or Syfy if you must) starts its own 31 Days of Halloween event. It starts with the Midseason finale of Warehouse 13 at 9pm, which I admit I have never seen. On Tuesday, Face-Off, a reality TV makeup artist challenge, starts at 9pm followed by the extreme design challenge series Hot-Set at 10pm from executive Producers Michael Agbabian, Dwight Smith, and Aliyah Silverstein, who are also responsible for Face-Off. They round out the week with Ghost Hunters, Paranormal Witness, Haven, Queen of the Damned and Primal. Never to be outdone, the Disney Channel and Disney Junior are holding October Halloween Events. They are calling their event Monstober over at DisneyChannel.com. Starting on October 1, there will be hours of excellent programing. They will screen Mostly Ghostly: Who Let the Ghosts out on Monday at 8:30pm. There is a My Babysitter is a Vampire marathon on Thursday, October 4, 2012. The Halloween themed season premiere of Austin and Ally on Sunday, October 7 follows the great lineup that started the week. Later in the month they’ll be premiering Girl vs. Monster. Over on Disney Junior they will have Boo for You Fridays with Halloween themed episodes and movies every Friday on Disney Jr. He looks like the Crypt Keeper! Every day at 6pm from Monday October 1 to Thursday October 4th, Hub, in it’s Haunted Hub Halloween event and contest, will play a creepy episode of one of R.L. Stein’s Haunting Hour or Goosebumps. Over at FEARnet, which is Halloween central, Will play a 2 hour block of Tales from the Crypt, every Friday during October starting on Friday, October 5 at 10 pm. All times are Eastern and you should check with TV guide, Zap2it, or Titan TV to see your local times and channel listings. There will be more frightening programming to come next week, so I bid you, Happy Hauntings until next time. Yesterday, Vanilla Ice posted a photo of his very ninja jack-o-lanterns. The fearsome foursome Jack-O-Lanterns were made with watermelons and the lighting they are using are either colored lights or glow sticks. If you don’t know who these are, I suggest you go google Teenage Mutant Ninja Turtles and spend a few days with netflix and the internet watching everything you can. I love the TMNT so much, and Vanilla Ice’s Ninja Rap from Teenage Mutant Ninja Turtles II: The Secret of the Ooze , which is superior to the first, in my opinion only because of Super Shredder and also I really like Vanilla Ice so make sure you follow him on Twitter for some very Ninja Tweets. Interestingly enough, as I searched for information about Turtles 2, I found out that it is available for Pre-Order or Amazon.com for the 3 pack on Blu-Ray. The Blu-Ray set, which features all three amazing Teenage Mutant Ninja Turtle Movies, will be released on November 13, 2012 just in time for the winter holiday season and at only $17.32 it makes an excellent gift for anyone on your list.